While considering the perfect cocktail to make for a family birthday celebration at the beach, I had two requirements: It needed to serve more than 10 and I wanted a departure from the obvious margarita/sangria/daiquiri beach go-tos. I flipped to a page in Fine Cooking's May issue featuring the story "Pleased as Punch," and found my recipe. In case you've been living under a custom-cut ice block, punch is back in a big way. "Thanks to today’s history-obsessed mixologists, vintage punches are on the menu in some of the nation’s hippest cocktail dens, from San Francisco to Boston," writes the article's author St. John Frizell. DC's craft bartenders have been hot on punch, as well. The fleeting underground Hummingbird to Mars greeted guests with cups of punch from a more than 300-year-old recipe. Warehouse Theater's Punch Club has dished out some classic concoctions, as has 14th Street's neo-speakeasy The Gibson. Poste is offering a punch menu in the garden, and you can find Todd Thrasher's Planter's Punch recipe here. 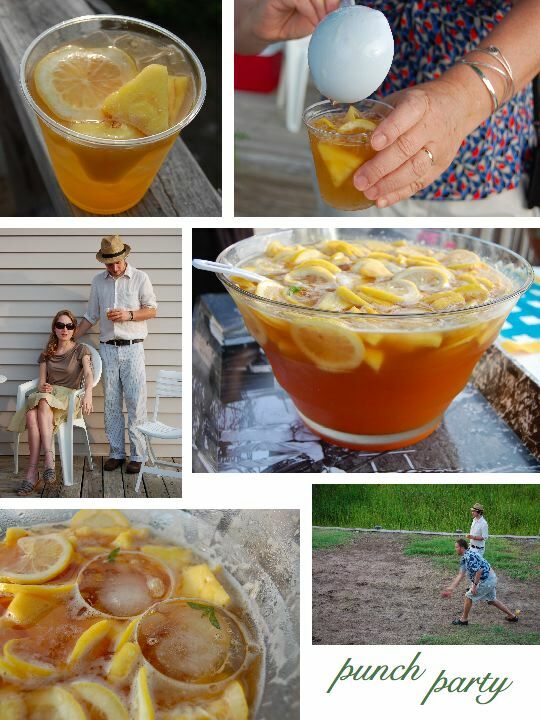 Our rented beach house had a perfectly massive glass bowl that screamed for punch, so I mixed up a batch of the St. Cecilia Society Punch from Fine Cooking. It was a delicious hit. Make a simple syrup by combining the sugar and 1 1/2 cups water in a small saucepan, and bring to a boil. Cook, stirring occasionally, until the sugar dissolves, 2 to 3 minutes. Remove from the heat, add the tea bags and ginger slices, and steep for 4 minutes. Remove tea bags and strain out ginger. Set syrup aside. At least 3 hours and up to 6 hours before serving, combine the lemons, brandy, syrup, rum, and pineapple in a large pitcher or bowl. Chill. Just before serving, pour the punch into a large chilled punch bowl with a block of ice. Add the sparkling wine and sparkling water, and stir. Optional: Grate a dusting of nutmeg over each glass. I love the aroma. 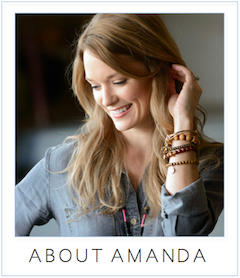 I'm in mad love with your photos, Amanda. I want lessons. Todd- I'll have to see if my Tivo caught the episode when I get home next week. And thanks to anon for the photo compliment. I had lovely sunset lighting to work with so that helped. Put it into a bowl where you can freeze it to act as your ice block. Thanks, Washington Cube. Sounds fabulous. Nice Post with lovely pictures! I can't wait to try the St Cecilia Society punch recipe! I am not sure why it took so long for punches to come back en vogue but I am so glad they did! There are some great punch recipes out there and they are so convenient to serve. I recently posted some traditional punches (http://rexandregina.com/blog/?p=622) and am always on the lookout for more recipes! Thanks! 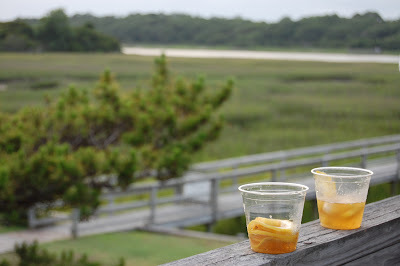 The photo of the two empty punch glasses sitting on the wood fence -I just love that. So simple. I'm having a "low country" dinner party in a few weeks and am on the hunt for just such a recipe. This one sounds like a contender.